The sun shone clear and brilliantly on the morning of Sunday, November 4th. Jet trails streaked pathways across a deep blue sky. 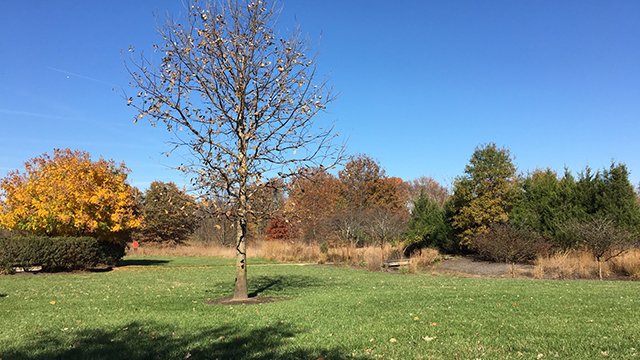 A small group of ECKists and other spiritual seekers gathered at the pavilion in Boundary Creek Natural Resource Area in Moorestown, NJ to immerse in the sounds, beauty, and peaceful rhythms of nature for a morning contemplation walk. After introductions, the group began to sing HU together. HU is an ancient word for God that can spiritually uplift people of any faith. The HU song floated out over the grounds in the light breeze, then gently hushed into quietude. For a time, everyone just listened as the Sound Current—the Voice of God which permeates all life—blended with the whispering swish of autumn leaves. The participants each drew a quote from a bowl, to use as an individual contemplation seed as each went their separate ways, at their own pace, along trails through woods and fields. The group agreed to meet back at the pavilion about 45 minutes later after their personal journeys. When they rejoined at the pavilion, everyone seemed invigorated both from the exercise and the renewal of perspective. People shared their realizations and unique insights. One woman reported feeling such happiness, such gratitude for special moments on the walk—particularly for seeing a beautiful bright pink-red rose petal. When she touched it, she said she was astounded at how incredibly soft and velvety it was. So smooth, so silky, so fragile! She explained that this was a special gift from the Mahanta, her Inner Guide, to help her more deeply understand how to face life gracefully. For her, it was a message to try to treat challenging people in her life more delicately—being softer, more tender with them like the rose petal needed. The group continued sharing and ate some snacks together. They sang HU once again and drank in the goodness of friendship. It was a fun time on a beautiful day. Each person left that morning happier, and with a fresh gratitude for God’s pure and simple blessings.